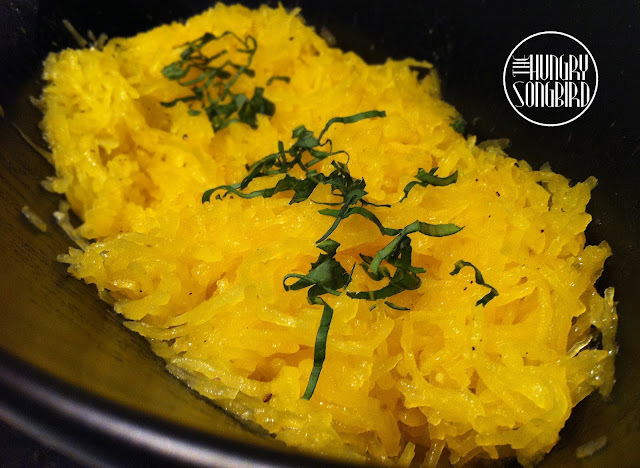 Spaghetti Squash is an amazing veggie. It blows me away every single time I have it. It’s so easy, so delicious, so healthy, and so cool! I love the way it comes apart with a fork, and with a little imagination, it tastes like pasta! There are two ways to go about cooking it, as I will explain below. This recipe is super simple & yummy, and I recommend using the “poking holes” method if you don’t own a REALLY sharp, serrated knife. Enjoy! 1. Preheat oven to 375°F and halve squash lengthwise. Use a spoon to scoop out and discard seeds from the middle of each half. 2. Arrange squash in a 9˝ x 13˝ casserole dish, cut sides down. Pour 1/2 cup water into the dish and bake until just tender, 30 to 35 minutes. 3. Rake a fork back and forth across the squash to remove its flesh in strands… it looks just like spaghetti! 1. Preheat the oven to 375°F. Prick the spaghetti squash all over with a skewer so it will not burst while baking. 2. Place the whole squash in a shallow baking pan and bake for 1 hour. 3. When cool enough to handle, cut the spaghetti squash in half, lengthwise, with a serrated knife. 4. Use a spoon to scoop out and discard seeds from the middle of each half. 5. Rake a fork back and forth across the squash to remove its flesh in strands. Place spaghetti squash strands in a serving bowl. Add the 2 tbsp. of olive oil & minced garlic, and toss well. Season to taste with salt & pepper. Garnish with fresh basil shreds. Delicious!